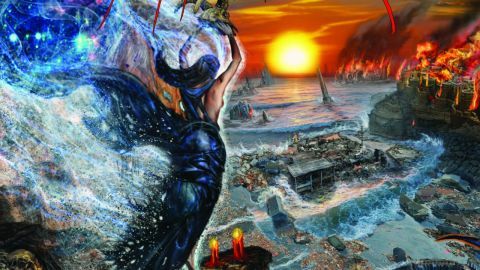 A band whose fortunes have been synonymous with the MySpace wave that boosted them to sudden, vertigo-inducing heights and then just as quickly became an afterthought, JFAC have nevertheless evolved on their own terms over the last nine years, releasing three albums of increasingly sophisticated death metal brutality. Sun Eater finds the Arizonan mob taking their greatest, most successful leap to date, with an album unlike anything we’ve heard from them before. Taking a more measured approach, the need to smash everything out at breakneck speed has been all but dispensed with; tracks such as opener Eating The Visions Of God being given time to breathe instead, with a heavier, doom-tinged groove holding the fore while the standout bass runs from Nick Schendzielos sit wonderfully high in the mix and deviations into more progressive territories add colour and texture to the journey of the songs. A very satisfying listen and their best work to date.